May Day March - No Cuts, No Bedroom Tax, No Evictions, No Privatisation - Saturday 04 May 2013 - 12:00. 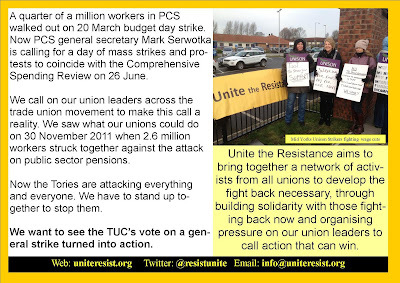 Join the Leeds Trades Union Council annual march for May Day. This year we are marching against self defeating Austerity and for an alternative economic programme which will create jobs and raise living standards. Join us and bring your banners, family and friends on Saturday 04 May 2013. Assemble in Victoria Gardens opposite Leeds Arts Gallery from 11:00 am. March to start at Noon. Rally will start at 12:30. 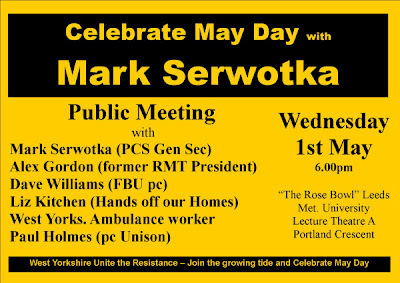 All welcome to hear Mark Serwotka - General Secretary of PCS talk about the way forward for British trade unions and socialists against austerity. Wednesday 01 May 2013, 6:00pm at Lecture Theatre A, Rosebowl, Leeds Met Uni. 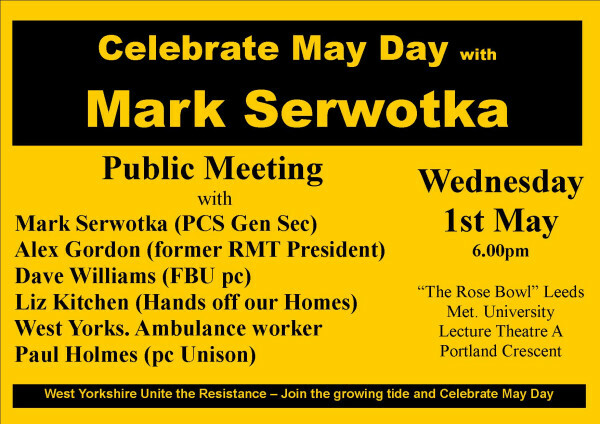 Everyone who wants to oppose the vicious cuts to vital public services in Leeds is welcome to attend our next meeting on Wednesday 24 April 2013 at 18:00. The Stop The Bedroom Tax protest on Saturday was a massive success for Hands Off Our Homes and their campaign to Stop the Bedroom Tax. 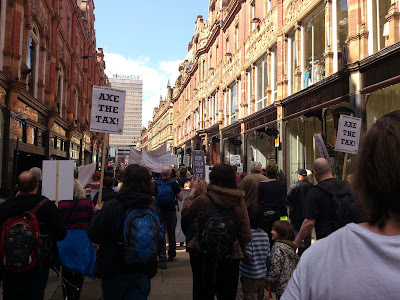 The demonstration was lively, noisy and made a great impression with many people joining the march and demonstration as it made its way around the city centre. The Rally heard some great passionate speeches from both those affected by the Bedroom Tax and those who attended the march to support them in Solidarity. 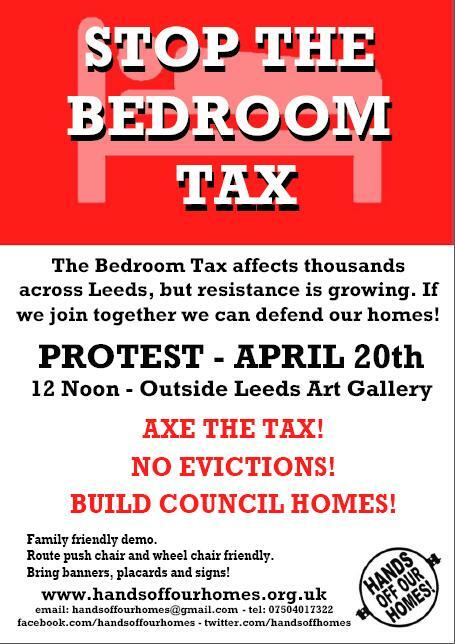 Stop the Bedroom Tax - No Evictions! Organised by Hands Off Our Homes. Big Demo in Leeds City Centre calling for no evictions due to the bedroom tax and an axing of the tax. Together we can defend our homes! 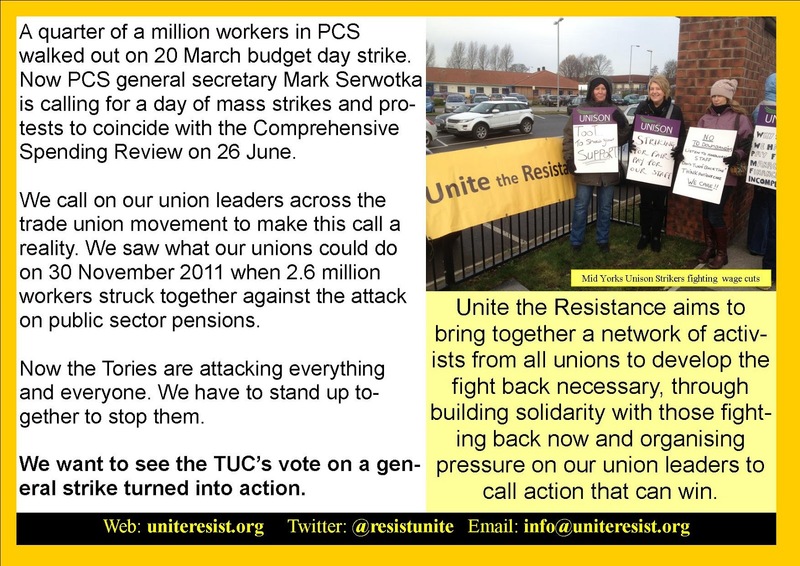 This is a protest to show our strength and what can happen if we get together and get organised. Bring Banners, Placards and invite your family and friends. Saturday 20 April 2013 - 12:00, Victoria Gardens outside the Art Gallery.